Claim Your FREE Engagement Starter Kit! Claim your FREE Engagement Starter Kit video series! Together, we walk through the first FIVE steps to setting yourselves up for wedding planning success. Ready? Let’s do it! Congratulations, and welcome to the Wedding Planning Podcast! That question is exactly why I designed a totally FREE Wedding Planning Podcast Engagement Starter Kit. In FIVE quick & concise videos, we discuss the very most important things for you and your fiance to handle before moving on to cakes and flowers and dresses and bachelorette parties. There are FIVE critical steps for you to address to get started in the wedding planning process. I’ll give you a sneak peek – almost all of the steps are inter-dependent on the others. This means that it’s extra important for you to take the time to have a thoughtful discussion about each topic with your fiance. 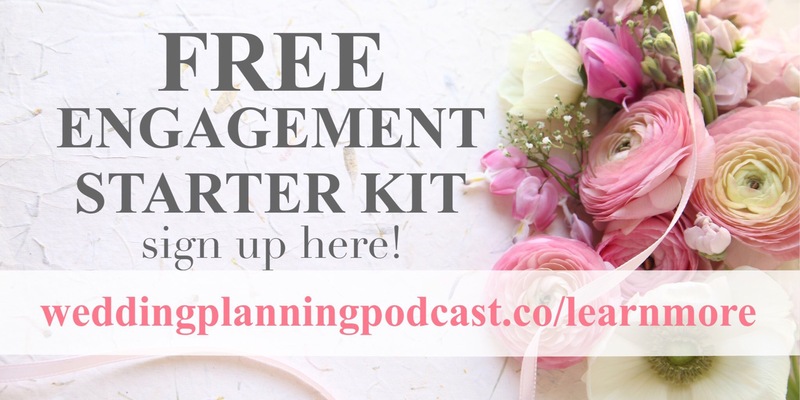 Sign up for the FREE Engagement Starter Kit to access all 3 BONUS SHOWS on getting started with your wedding plans! I designed the Wedding Planning Podcast to help you take the overwhelm and expense out of wedding planning. I craft each episode specifically to streamline & simplify the wedding planning process. Because let’s face it – planning your wedding can be overwhelming, expensive, time consuming and stressful! There is just way too much information out there that makes you doubt your common sense judgement and second guess your decisions, and I want to be your voice of reason through the process. I know that not everyone has the budget to hire a dedicated wedding planner in the months leading up to the wedding. That’s why I’m here to lend you my honest, professional, and down-to-earth thoughts on the best ways to craft a meaningful, affordable, and unforgettable wedding day! I truly hope you find our weekly meetings valuable, and that I can help keep things in perspective as you plan away. Last thing before we go – if you have questions about the podcast or the Engagement Starter Kit, please be in touch!